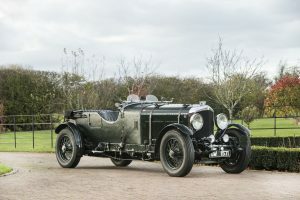 This 1931 Bentley 8-Litre Sports Tourer, which previously belonged to Sir John Alexander Arnott the former chairman of the Irish Times, comes up at Bonhams auction of Les Grandes Marques du Monde at The Grand Palais in Paris on February 7. It is lot 232 and estimated at 600,000-800,000. Arnott’s father, Sir John Arnott, first baronet, was the founder of Arnotts department store chain. He was a major figure in the commercial and political spheres of late-19th century Cork. In 1873 he purchased the Irish Times for £35,000 from the widow of its founder, Major Laurence Knox. John Alexander Arnott, second baronet, became managing director and chairman of the Irish Times in 1900. He held these positions until his death in 1940. Arnott’s ownership of the 1931 Bentley is thought to date from March 31, 1937, when a continuation logbook was issued for the vehicle. The original owner, James C Clark, was a US cotton millionaire and keen sportsman from New Jersey. Judging from the logbook, the vehicle was unlicensed and hence unused between December 31, 1939 and August 15, 1956 when it was re-licensed by new owner James Robert William Murland in County Down.